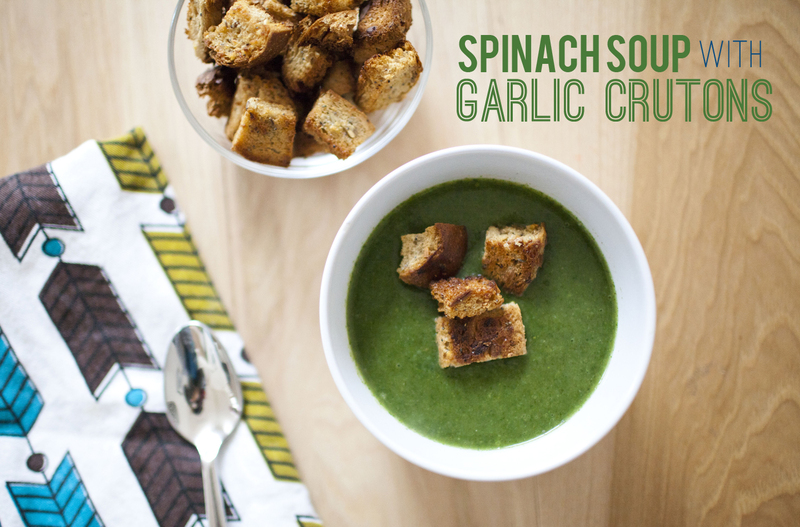 spinach soup with garlic crutons. Here is a simple soup to make, courtesy of Joy the Baker. Don’t skip out on the crutons. they totally made the soup! To prepare the soup, heat olive oil in a large saucepan over medium heat. Add onions and saute until soft and translucent, about 5 minutes. Add garlic, thyme, and salt and saute for 2 minutes. Add potatoes and saute for 3 minutes more. Pour in stock and bring to a low simmer. Simmer for about 15 minutes, or until potato chunks are cooked through. Reduce heat to low and add spinach leaves. Stir and cook spinach down in the hot broth for about 5 minutes. Remove from heat and puree soup with an immersion blender. Once pureed, squeeze in the juice of half a lemon. Stir. To prepare the croutons, place a rack in the center of the oven and preheat oven to 375 degrees F. Line a baking sheet with parchment paper, place bread crumbs on the parchment and set aside. Heat oil and butter in a medium saute pan until earth balance is melted. Add sliced garlic and cook for 3 minutes. Remove garlic from the pan and discard. Remove fat from the heat. Add thyme. Stir to combine. Drizzle melted butter mixture over the bread cubes. 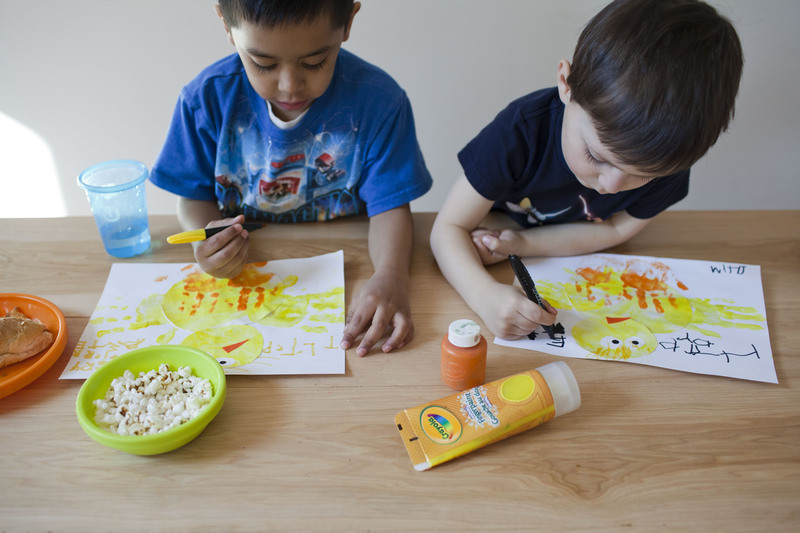 Sprinkle generously with salt and toss with your hands. Bake for 12-14 minutes or until cubes are golden brown and crisp. 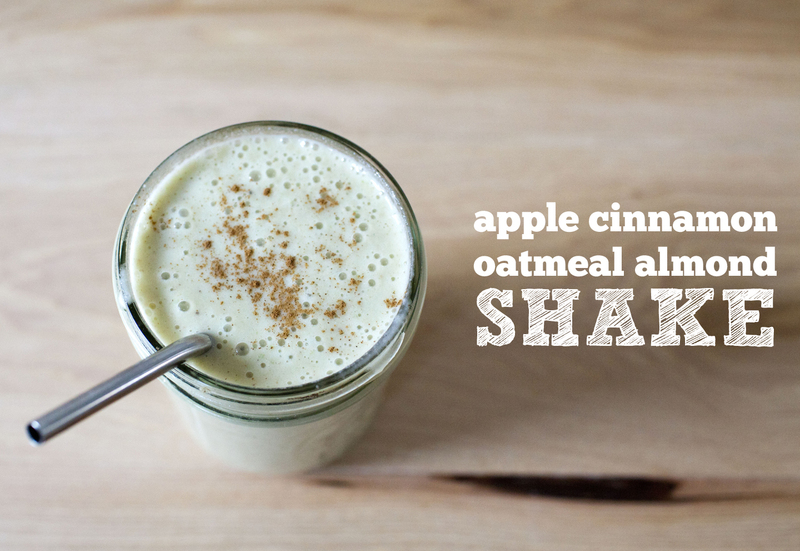 apple cinnamon almond oatmeal shake. Just taking note of a great breakfast shake! 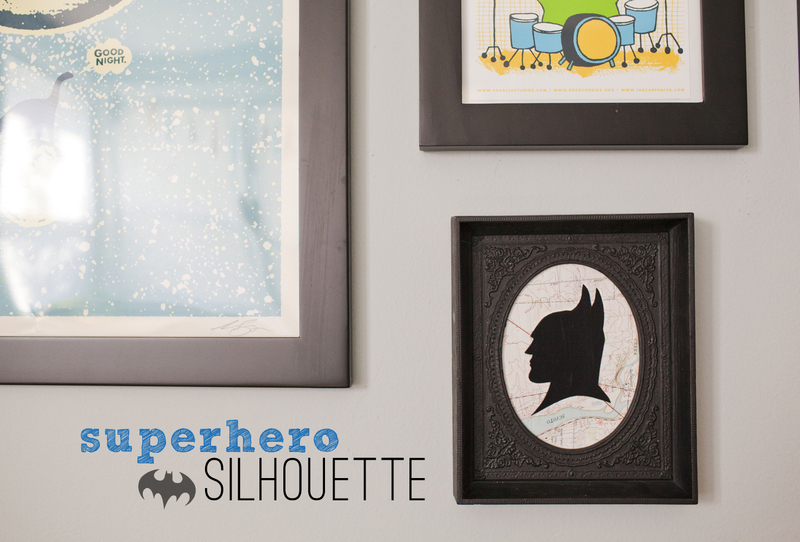 I made a silhouette once before; and I still had one more frame to use from when I scored these two for 10 cents at a garage sale this summer. I saw something like this on pinterest, and knew I had to make one for milos room. I found the batman art here; spraypainted the frame black (it was a gross brown color before); then used mod podge to affix the batman to the map paper. I used a heavier cardstock for the black batman because regular paper wilts and wrinkles when you use the mod podge on top of it. I originally thought of using a page from a comic book, but when I put the art on it, it didn’t stand out enough. You definitely want something that will make the black stand out. I love this! 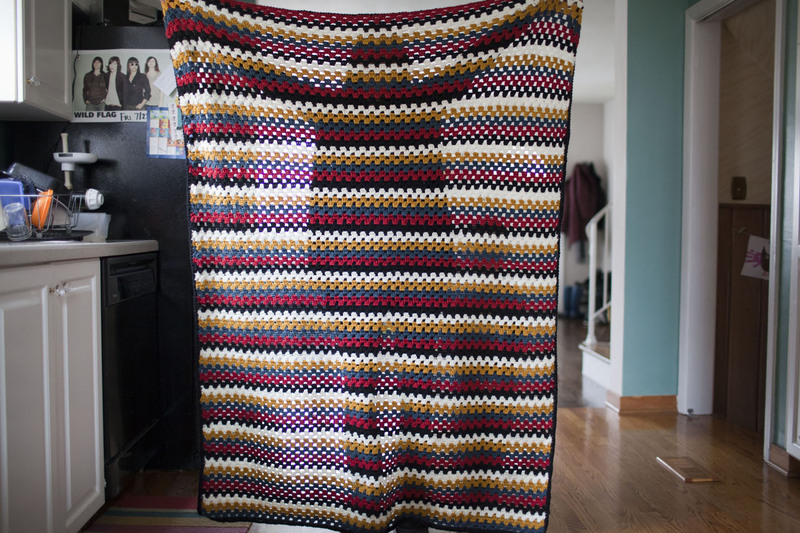 I think its whimsical and fun, and it works perfectly in milo’s room. 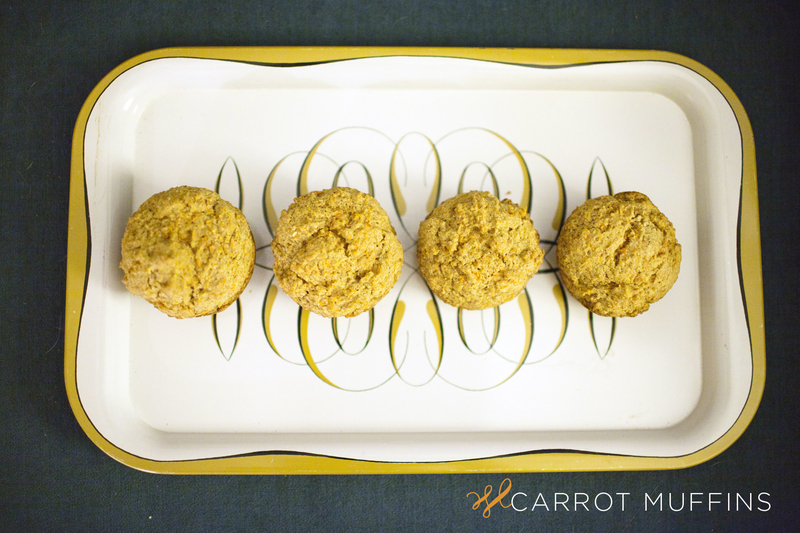 i was pretty skeptical when making these muffins because they called for ALOT Of carrots, were low in sugar and had alot of healthier type ingredients (spelt flour?!). They are probably one of THE BEST muffins i have ever made. 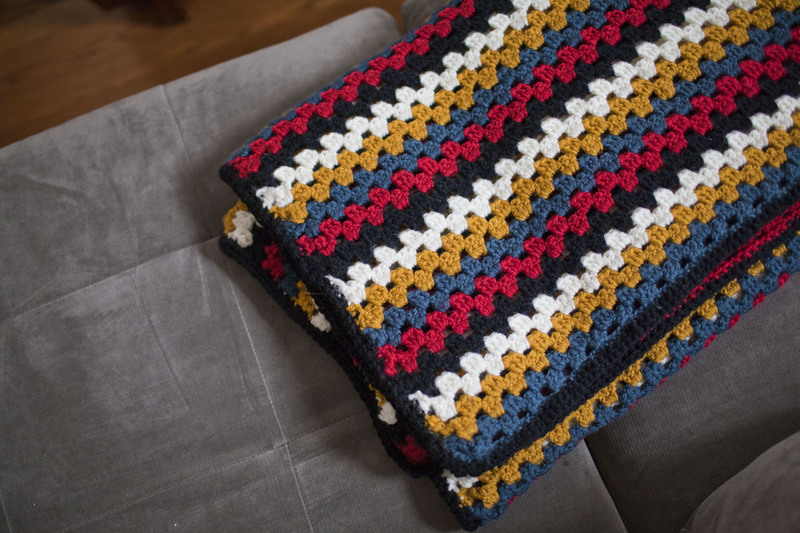 I will be making these again and also try experimenting with adding some other things (maybe zuchinni in the summer?!). Place carrots in food processor and pulse a few times until they are grated. Add in the egg replacer, sugar, applesauce, vanilla and coconut oil and blend until combined. I don’t know about you, but I’m definitely starting to get over winter and am ready for spring…Don’t get me wrong, I LOVE the winter, I’m just ready for warmer days ahead. 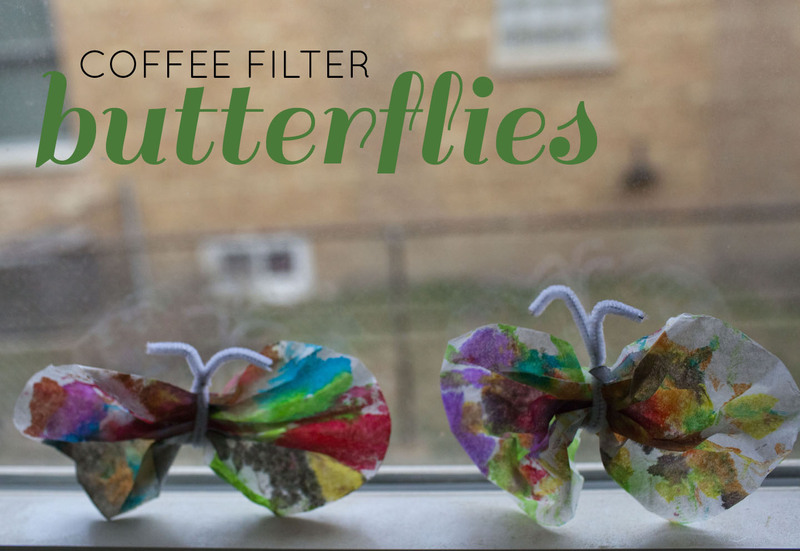 That being said, Milo and I worked on making these simple coffee filter butterflies in anticipitation of the first day of spring ahead. 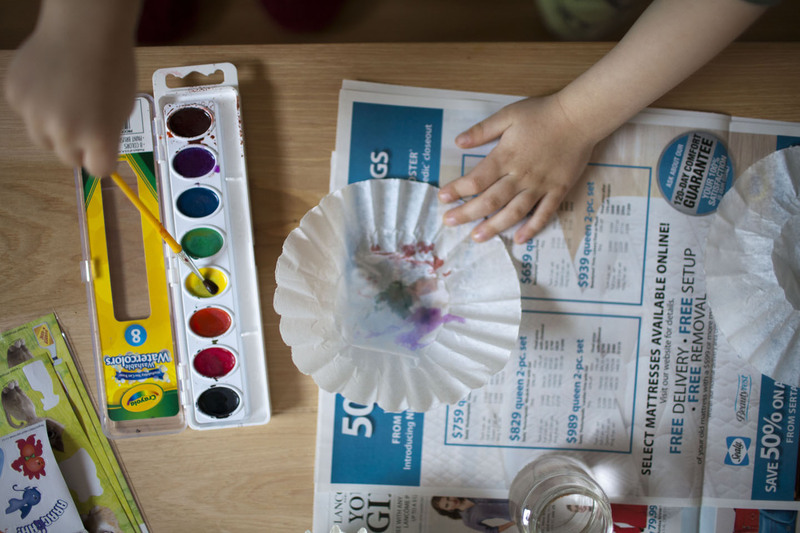 They are super easy to make and will keep your toddler or preschooler entertained for a bit. So what are you waiting for? 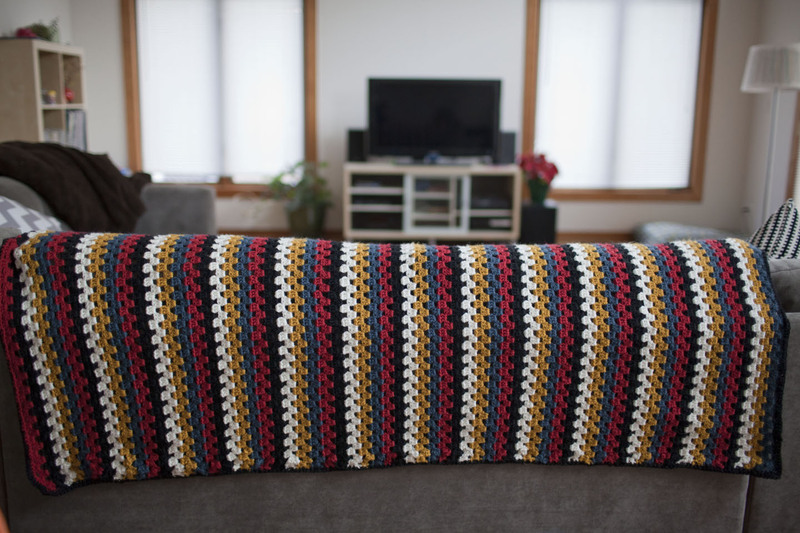 Get started on making yours and show me your progress! A few weeks ago, a very kind co-worker who has a vegan daughter made this soup and thought to share some with me. She brought me a lunch size portion to work, and it was so delicious. I made it the following day bcause I couldn’t get enough of it – and I made it again this weekend. It may not be the prettiest soup – but its really healthy, packed with protein, and my little guy will eat it right up. I love the unexpected ingredient: peanut butter! I know what you are thinking: peanut butter?! In soup?!!! 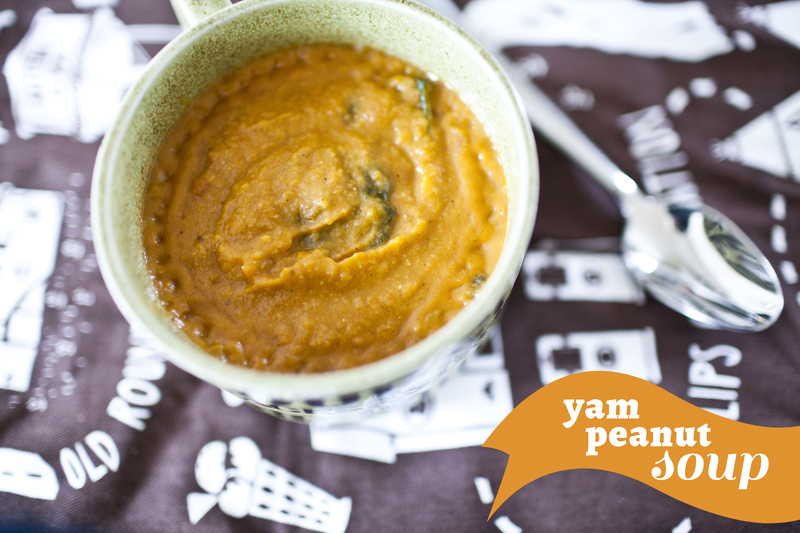 You don’t add alot, so its not overpowering – the combination of sweet potatoes and peanut butter works so well! Enjoy. Hopefully it wont be soup season for too much longer…. Heat olive oil in a large pot set on medium heat. Add the onion and begin sauteeing till onion is getting translucent (about 3 minutes). Add the garlic and ginger, and continue to sautee for another 3 minutes, till garlic is fragrant. Add the yams, the red lentils, the tomatoes, the cinnamon, cumin, turmeric, and cayenne and give it all a quick stir to combine. Add peanut butter and stir well. Using an immersion blender, blend soup till about half of it is pureed and the other half still has texture. The soup should appear creamy, but chunks of sweet potato should be visible. Stir in the kale and let it wilt. Season to taste, adding more salt and pepper as needed. I’m intrigued by raw deserts, but they seem like they can be kind of expensive, considering all the ingredients and time that goes into them. I have been pinning a few here and there lately that have peeked my interest and might start giving them a try….These were a simple treat to make, made with ingredients I had on hand. ( I seem to have alot of almonds on hand currently so I used those!) They are fairly healthy for you too, considering they have no refined sugar! They should satisfy a craving for something sweet and chocolatey. 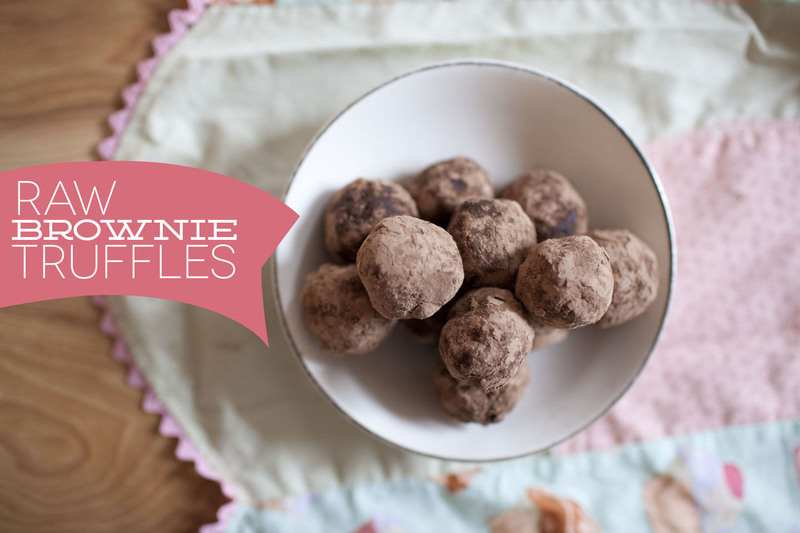 And you can roll them in all kinds of goodness – and make a whole variety of truffles. Place 1 cup almonds in a food processor ( i used my vitamix) (you can also use any kind of nuts or combination of nuts here) and get them chopped up (not too fine). Add 1 cup pitted dates and mix until it starts to stick to the blade. Add 4 T shredded coconut and 5 T cocoa powder and mix. Then add 2 T agave and mix until combined. Roll into walnut size balls and then roll them into your topping. I rolled mine in cocoa powder and cinnamon. 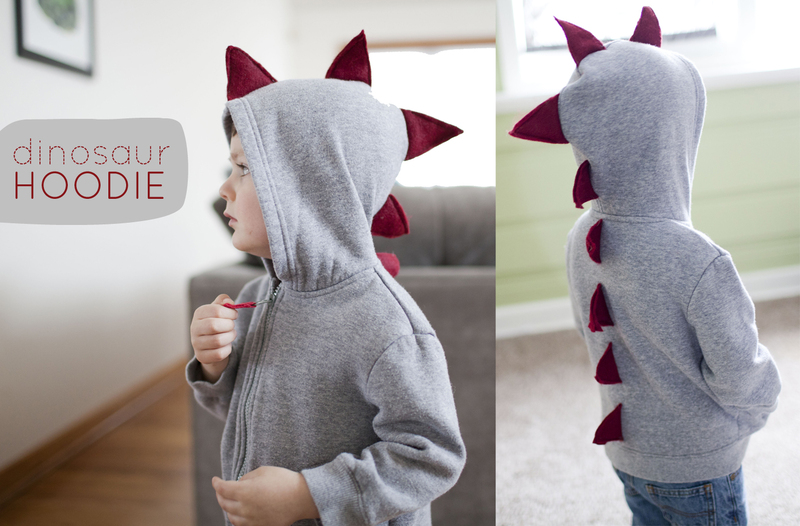 Every kid needs a dinosaur hoodie! 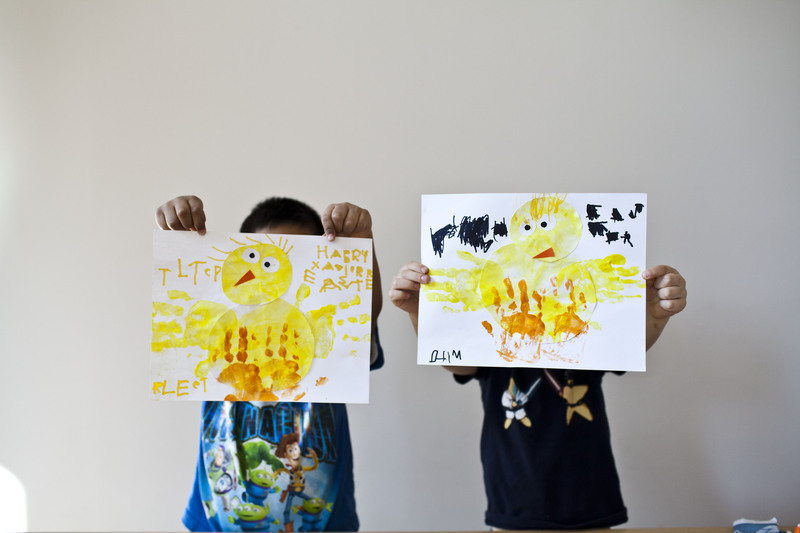 These are so easy to whip up! 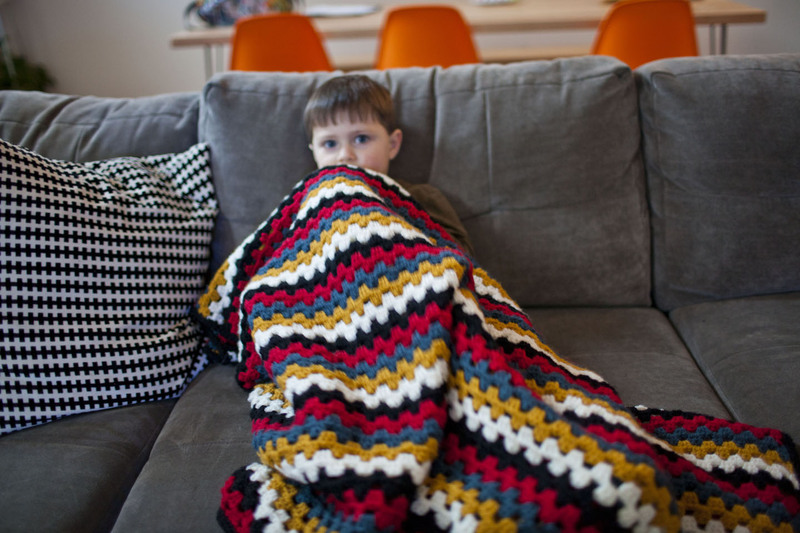 All you need is a hoodie and some felt, and a sewing machine (although you could probably easily do this by hand, it would just take a little bit longer). I had this thrifted hoodie sitting in milo’s closet, and I dug into my felt stash to make the spikes. 1. 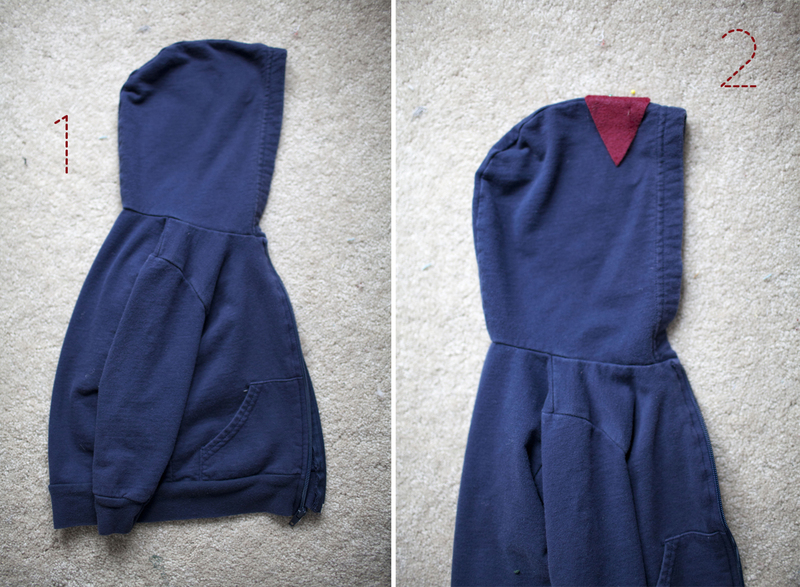 Fold your hoodie in half. You can iron it to make a nice crease – you will be using this as your guide to pin the spikes. 2. Pin the spikes to your hoodie – the middle of the spike should line up with the crease. 3. Once all your spikes are pinned, sew each one down the middle of the spike. 4. Once all your spikes are attached to the hoodie, then fold the spikes in half and sew up the sides of the felt.